Arisaema tuber (Tiannanxing)-Arisaema consanguineum Schott. Botanical Name: 1. Arisaema consanguineum Schott. ; 2. Arisaema amurense Maxim. ; 3. Arisaema heterophyllum Bl. Part Used & Method for Pharmaceutical Preparations: The tuberous rhizomes are dug in autumn or winter. After the fibrous roots and bark have been removed, the rhizomes are dried in the sun and cut into slices. Properties & Taste: Bitter, pungent and warm. Meridians: Lung, liver and spleen. Functions: 1. To dry dampness and resolve phlegm; 2. To dispel wind and stop spasms. 1. Phlegm-damp cough manifested as profuse, dilute and white sputum and stifling sensation in the chest: Arisaema tuber (Tiannanxing) is used with Pinellia tuber (Banxia), Tangerine peel (Chenpi) and Immature bitter orange (Zhishi) in the formula Daotan Tang. 2. 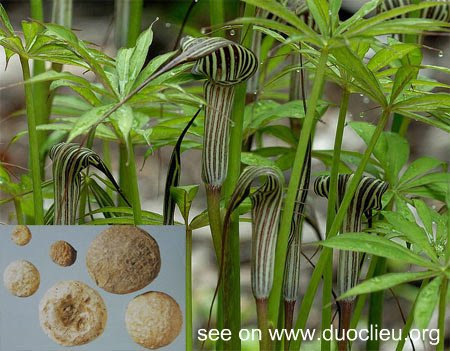 Phlegm-heat in the lungs manifested as cough with profuse, yellow and thick sputum and stifling sensation in the chest: Arisaema tuber with bile (Dannanxing) is used with Scutellaria root (Huangqin) and Trichosanthes fruit (Gualou). 3. Wind-phlegm manifested as dizziness, vertigo, rattling sound in the windpipe, facial paralysis, epilepsy and convulsions in tetanus: Arisaema tuber (Tiannanxing) is used with Pinellia tuber (Banxia), Gastrodia tuber (Tianma) and Typhonium tuber (Baifuzi). Cautions & Contraindications: This herb is contraindicated during pregnancy. In general, the raw herb is not used for internal use. When arisaema tuber is powdered and mixed with ox bile, it is called Arisaema tuber with bile (Dannanxing). The combination is bitter and cool. It clears heat and resolves phlegm, dispels wind and stops convulsions. It is used to treat convulsions, windstroke and epilepsy. The recommended dosage is 2-5 g.